They call us Millennials, but what does that really mean? Other than a load of egotistical judgmental phrases. Those who know me have heard me mention the Pluto Scorpio generation (article soon to follow) multiple times and how all of us millennials share that aspect in our charts. 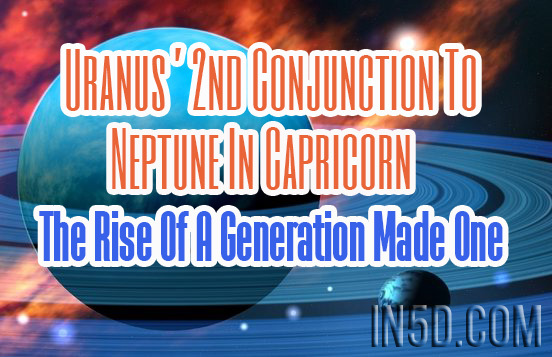 Another KEY aspect we have in our chart (1988-1998; with major emphasis on year 93) is a conjunction between Uranus and Neptune. When analyzing the space in the sky in which an individual is brought into existence with the first breath, we view it as a circle in which said individual is the center. We cannot have exact measurements unless we know the exact time and location of birth so that’s 1 reason why natal charts are simply guidelines. Everything is still dependent on the attitude of the individual, regardless of what astrological aspects are in their nature- we are simultaneously being conditioned by exterior experiences on Earth and this must be taken into consideration. A birth chart is said to be God’s formula to the problem of our existence. Its framework lays out the planetary functions that make up our very being and display how we can act in harmony with this flow and thus reach our highest selves, becoming more in tune with our inner powers. Again, this is all subject to the individual’s attitude and willingness to be born again and again- to recognize each experience as a test of self. We can only understand these matters as much as our consciousness can grasp. (**Since Mercury and Venus lie in the Earth’s orbit and not the Sun’s, they have two conjunctions in their solar cycle, no opposition** Article soon to come on the 4 Faces of Mercury explaining the 2 conjunctions and entire solar cycle). The cycle begins with the conjunction, where both planets occupy the same degree- or within 10 degrees- and between these 2 planets (Uranus and Neptune), it occurs at about 171 year intervals. When the 2 planets at play get along and work well with each other- such as the Moon and Venus- this aspect is even greater influenced in our nature. And yes, the aspect can be inharmonious if the 2 planets don’t get along as much like say Mars and Neptune. In this particular conjunction we’re dealing with 2 of the most outter planets, thus 2 of the slowest planets, Uranus and Neptune. (The third outter planet is Pluto. Truthfully, the 3 of these planets together are key to our conscious evolution, but today we’ll focus on the first 2 of these 3, and I’ll save the talk on Pluto Scorpio generation for another piece). It just so happens that these 2 go hand in hand! It’s beautiful and purely cyclic! Both planets are incredibly influential in greater mass, collective changes. Groupthink! Uranus is quite the planet. They say its cycle around the Sun coincides with our cycle of life as far as an individual reaching self-realization. It spends roughly 7 years in each sign- 7 years x 12 signs = 84, which is the age at which they say a person will have reached that ultimate form of self-awareness, having gone through the whole cycle of Uranus. On an individual scale there are 3 key phases in this cycle, first from birth to age 28 , where we are purely instinctual. Second phase is from age 28 to age 56, where we are filled with social-cultural stuff, further away from the source of our birth and establishing ourselves as unique and independent individuals. The third phase is age 56 to 84, where we reach a point in our lives of realizing the inevitable death waiting for us all. At the conclusion of the preceding stage and going into this stage, is where we begin seeing that midlife crisis occur. We realize our deaths are inevitable, thus WE are inevitable, and in that we can develop deep feelings of hopelessness, but the key is to accept that all things are cyclic and before Western practices deemed death something to fear, it was truly something to embrace, believing that the afterlife merely carried you into the next life. One could call Uranus an abrupt a-hole, determined to awaken and illuminate that which is associated with independent spirit within humanity. He rules over the “hidden genius” which rests in every man/woman, waiting to reveal the dramatically unknown to those occupying the same realms in their own depths of self- to come together and rise with a mutual cause. Together, making transparent the sudden changes that must take place in order to breakthrough and focalize/manifest that which interconnects- this is where Neptune steps in and helps as he is the symbol of Collectivism! Neptune rules over many realms, as do all planets. Each realm connected to the next, linking planetary energies in the most profound ways. It’s all a part of the structuring framework currently in play, and we must study these cycles to have a greater understanding of the WHOLE and to have a greater understanding of our role in the grand scheme of human evolution here on Earth. The more ignorant we are to these forces the harder we’ll have to fight for our freedom here on Earth. Regardless, it’s a fight, because the trends of today are designed to create a uniform society, not a society in harmony. Harmony (unity) and uniform can appear the same to the feeble minded, but they are drastically different. The cycle of Neptune can display itself through history as we see the individualistic sense of mankind being pressured by the greater collective and these pressures slowly weakening the edges of limitations placed on the individual. This is when we see mankind attempt to formulate a greater, all-inclusive, harmonious framework for his systems in place. (A good example given by my favorite Astrologer, Dane Rudhyar, is when the first cycle of Neptune could be viewed geocentrically- from Earth- with Neptune 0 degrees into Aries on April 13th 1861, when the fall of Fort Sumter marked the beginning of the Civil War). The beauty of Neptune is it works silently, slowly eroding away the pillars of a once respected institution, washing away corruption to take back what’s right and let go of the preceding cyclic events with compassion, love and forgiveness. However, attempts to wash away and start anew can only be done to the extent at which the general population can feel that compassion I just spoke of. And to the extent at which we can focus on understanding the importance of w h o l e n e s s, rather than sticking to the egotistical realms of “analytical, quantitative, and rational intellect”. Like my friends always hear me say, the soul does not need to know, the soul needs to u n d e r s t a n d; it is the ego that must know. Now, going back to the fact that at the moment of concrete existential birth here on Earth for the majority of my generation, these 2 planets were in conjunct to one another, we can see the energy of these 2 metamorphic planets fuse together to help us understand both ourselves, and how to implement change in our collective society. Working together, as Uranus helps us discover our inner erudition, to help the Neptune that binds us all, crumble the many points of the current systems conflicting with our innate sense of love. This particular conjunction insists special forces at play within humanity. Typically, only 2 conjunctions take place in a zodiacal sign. This conjunction however- between Uranus and Neptune- takes place 3 separate times in Capricorn. The first time was in 1821, then again during the build-up of our generation (as it entered within a 9 degree orb of conjunction in ‘88, remaining in orb until ’98 -reaching exact conjunction once in February, August and October of 93), and we will see this magical aspect once again in 2164 (obviously we’ll see it in the next life lol). The fact that this aspect takes place 3 times in Capricorn proves even more that the universe is guiding us to fight that which divides us and stand together in rebuilding the framework of a “world made one world”. United, not uniform. Capricorn is an Earthly one, representing customs and traditions of the past. So there ya go, the energy (that of Uranus conjunct Neptune) that supports these reformations is occupying the very field of life experience (Capricorn) where these changes must occur! This may appear as utter chaos to those unaware of it’s true implications, because of course, with great changes comes destruction (we see Pluto play a huge role in this part- as he is the “destroyer”, but first we need Uranus to “awaken the individual mind out of the sea of the collective” to reach the higher purposes of said collective through Neptune). With the exact conjunctions of 93, Astrologers actually believed “great” things were going to happen and it was going to be one hell of a crazy year for bringing down the system, but on the surface things were quiet. I believe, this is because Neptune and Uranus represent underlying forces and these particular forces were being formulated into my generation’s very existence. In our nature. Our destiny. Nothing occurred on the surface to bring down the trends of today but a generation infused with that power was born and we will bring all those matters to the surface in due time. It’s already happening! Now, focusing on just YOU brings us into a whole new sector of Astrology and that is in understanding where these forces lie within YOU specifically. What part of your life is directly influenced by these energies? To figure this out, we have to understand the structure of the Houses of Astrology. This I will explain some other time, so stay tuned and keep on loving your magical self! About the author: My name is Melanie and I have dedicated myself to a life of Love. I have been a star studier since age 16, and in the most recent year and a half I have truly began my inner unfolding as I dive into the depths of myself and come into contact with some ugly faces of my own demise. One by one, making friends with each face encompassed in my being. I believe that the greatest form of unconditional love is to share knowledge and teach- and of course to always remain teachable. I am a mother and a wife and in these roles lay my favorite parts of myself. I hope you can all find value in what I express from my planetary studies. It’s in my nature to openly express and I do it entirely out of love. If you’d like, follow me on Instagram @youcancallmemelanie . Much Love, ya’ll!